When you have spent time watching several different projectors, you may start to become familiar with their own unique inadequacies. It’s like watching a movie that was shot on film instead of digitally. For scenes shot on film, you’ll notice small spots appear on the screen. Those spots originated from the film negatives. And after watching a couple of films, you really stop seeing them. But what happens when the spots go away, and everything becomes clear? Suddenly, the experience seems totally new. Some projectors are capable of overcoming their seemingly inherent inadequacies. In doing so, their presentation can become as stunningly different as the switch between film and digital. Perhaps in another decade or two, this kind of amazing visual fidelity will become available for mid-range projectors. But for the time being, it’s only possible for models that are among the best on the market. As the name suggests, the Epson PowerLite L500W is a laser diode projector. When you’re looking at projectors that are supposed to offer best in class performance, you can almost start to take some things for granted. For example, the PowerLite L500W has numerous connection ports. But past the $400 range, that almost goes without saying. What really helps distinguish the PowerLite L500W is its crisp visual fidelity, and widely adaptable feature set. There’s a fairly heavy emphasis on visual performance, but without depending on image resolution alone. Though resolution is important, if you’re trying to create a home-theater experience, it’s far from the most important element a projector like the L500W can provide. Inside the almost bland-looking white chassis is an enormous amount of video hardware. Certainly, the equipment itself looks like nothing special. The Epson PowerLite L500W measures 17.3 x 12 x 5.3 inches, and weighs the better part of 20lbs. Apart from the fact it’s a bit bulky, it looks almost identical to any projector, including many which are ten times less expensive. To be clear, the chassis is far from an eyesore. It just doesn’t look like a top shelf projector. Though it doesn’t reek of style, ultimately you aren’t going to be looking at the projector, you’re going to be looking at the screen. 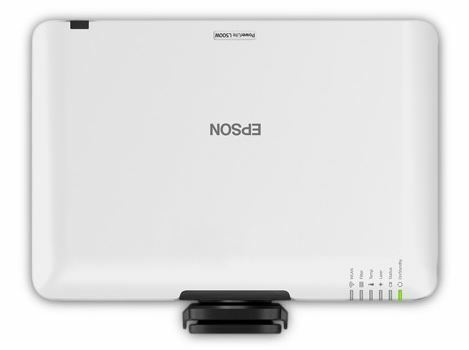 The Epson PowerLite L500W Laser Projector can support front, ceiling, and rear projection. Essentially any way you might want to mount or position a projector, the L500W is capable of accommodating you. Much of this adjustability is possible due to image correction tools, but we’ll look at those later on. The front side is covered with six indicator LEDs, but unlike many indicator LEDs, these actually provide you with useful information. For example, they can inform you about the connection status of your various video inputs, or give you a heads-up if the projector is experiencing a network problem. On the backside of the PowerLite L500W, the connection options are almost overwhelming. There’s a LAN port, RS-232C port, independent audio in-out ports, VGA in/out ports, a pair of HDMI ports, and a service port. Basically, anything and everything you might want to connect to the projector is possible. The only ports that are missing are some ports unique to PC monitors, which really have no business being connected to the Epson PowerLite L500W Laser Projector to begin with. On the right side of the ports, the Epson PowerLite L500W Laser Projector has placed numerous analogue button controls. For starters, there are four arrow directional keys surrounding a central “enter” button. Beneath that intuitive layout, you’ll find a menu button, audio-video mute button, and power button. Really, just the essentials. It’s also worth noting these controls closely mirror the controls which are used on the included remote. Once you’ve got a good feel for using one of them, using the other becomes simpler. From either the projector or the remote, any feature the PowerLite L500W is capable of providing can be accessed with a couple of taps. Installing a projector can be tough. Especially if you’re trying to create a more elaborate setup, like a ceiling mount that’s required to use harsh angles. But the Epson PowerLite L500W Laser Projector is capable of providing 360-degree flexibility in its installation. That range of projection capabilities is all possible because of the support of powerful correction tools. First and foremost, that includes keystone correction both horizontally and vertically ±30 degrees. Whether your projector is flat on the ground, or hanging way up on the ceiling, that’s all the adjustment you need to hook up your equipment almost anywhere. The Epson PowerLite L500W Laser Projector also makes adjusting the picture a bit simpler with Quick Corner technology. That allows the projector to correct the size or shape of an image without you needing to tune the settings yourself. It means you spend less time with the remote in your hands, and more time actually enjoying your projector. The PowerLite L500W offers a native resolution of 1280 x 800 WXGA using 16:10 aspect ratio. If you were comparing this projector to a television, what we’re looking at is approximately 720p. And that’s absolutely perfect for the distances supported by the throw ratio of 1.38 – 2.24. Image resolution is important. But more than anything else, people turn to projectors because they want to create a cinematic experience. And resolution isn’t the key ingredient to recreating a cinematic feeling. Some of the elements which can be equally important include brightness, contrast ratio, color vivacity, and so on. The Epson PowerLite L500W Laser Projector uses a RGB liquid crystal shutter projection system. The LCD screen is a modest 0.59” sensor, driven by a poly-silicon TFT active matrix. This seemingly small equipment allows for 10-bit color processing, and supports up to 1.07 billion colors. In other words, it grossly puts to shame the color vivacity you’ll see on any common LED monitor or television. Those panels are typically restricted to as few as 16 million colors. While all of these things are a great start, and they help the L500W to look amazing, we haven’t yet got to brightness. Among the many features a projector has to offer, brightness is often the most important. The PowerLite L500W supports a maximum brightness of 5,000 lumens, nearly twice as bright as any mid-range projector. This intense brightness is what allows the L500W to perform so well, in so many different circumstances. Both well-darkened rooms, and rooms which have more difficult lighting conditions. Though it’s important to keep your expectations realistic. You’ll never be able to use a projector that gives flawless visual presentation while you’re projecting in the light of day. But the Epson PowerLiteL500W Laser Projector gets you far closer than nearly any other projector. The intensity of its brightness promises both visual fidelity and consistency. And ultimately, brightness is what allows the Epson PowerLite L500W Laser Projector to support a hugely impressive contrast ratio of 2,500,000:1. Deep contrast ratios like this are the secret behind an excellent cinematic presentation. Whether you’re trying to watch an action flick or a documentary, every color pops off the screen, almost as if you were watching it in 3D. The bulbs used by projectors have a finite lifespan. In this case, the light is capable of lasting about 20,000 hours when you’re using either the quiet mode or normal mode. If you swap over to an eco-mode, you’ll find the lifespan of your bulbs pushing out towards 30,000 hours. Of course, it’s often a good idea to swap out those bulbs long before they’re due. That’s especially true if you happen to be taking advantage of the upper limits of the brightness settings. The brightness of a bulb gradually decays over time. Long before the bulb dies, you may find it’s only giving out 2,000 lumens. Because it happens at a terribly gradual pace, it’s often hard to tell when it’s occurred. But even if you replace the bulbs at the 15,000-hour mark, that still works out to multiple years of undisturbed play. The PowerLite L500W makes it relatively simple to swap bulbs as well. In addition to all the standard eco modes you’ll find on almost any projector, the Epson PowerLite L500w Laser Projector includes a constant brightness mode. The general idea is to fine tune your brightness settings, ensuring you don’t lose visual fidelity while maximizing the lifespan of your equipment. In other words, by throttling it back from the maximum setting, but not to the point you can tell it’s happening. 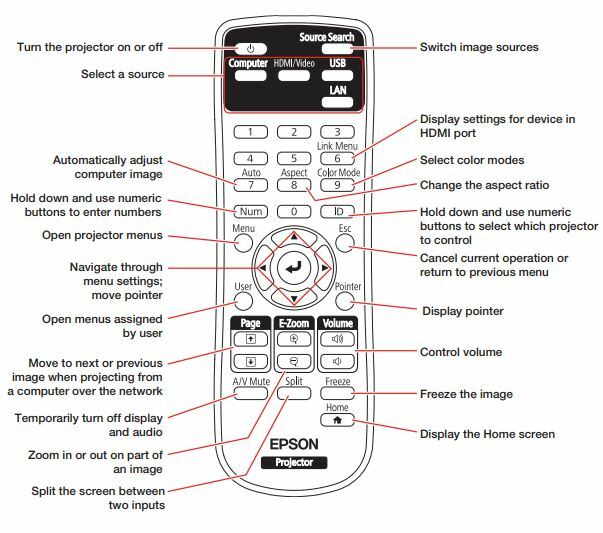 The Epson PowerLite L500W includes a power cord, VGA cable, remote control, and batteries for the remote. It also includes a quick setup guide with visual instructions and a cable cover, though neither of these are likely to be particularly useful. What might be useful is that Epson has a variety of different mounts you can attach to the L500W. They’re not included with the L500W Laser Projector, but Epson’s back catalogue has enough of these support options that they demand consideration. Who Should Choose the Epson PowerLite L500W Laser Projector? First and foremost, the PowerLite L500W is ideal for people who are sitting at viewing distances which are optimal for 720p content. This projector is in the same price range as some projectors that offer 1080p or 4K. But if you’re sitting at distances where 4K is advantageous, it’s important to recognize how much you have to sacrifice to have to reach those higher resolutions. Staying within this price range, higher resolution machines will fail to compare to the PowerLite L500W when it comes to brightness, contrast, color depth, and overall presentation. And unless you’re really taking advantage of the differences in viewing distances, you’re not making those sacrifices for little, you’re making them for nothing. In other words, the Epson PowerLite L500W Laser Projector is a great choice for someone who values pristine cinematic quality projection. Excellence can be expensive. But you know it when you see it, and it’s easy to see with the L500W.